The use of ultrasonic technology for welding and joining applications continues to expand at a pace, as the flexibility and capability of the process is realised by a growing number of industry sectors. A recent application by Telsonic UK demonstrates a state-of-the-art approach to the production of pleated filter media, in a machine that is capable of manufacturing a comprehensive range of filter component sizes. Parker Filtration has two existing Telsonic machines that have been running in production reliably for some 15 years. As the range of filter components being manufactured by the company continues to expand, and demand for the product increases, Parker turned once again to Telsonic for the supply of a next generation system. The new system not only incorporates the latest in Telsonic’s ultrasonic technology, but a host of additional features aimed at improving efficiency, ergonomics and process data acquisition. The machine is used to ultrasonically weld and seal the longitudinal part of pleated filter membrane material. The range of products to be manufactured by this new machine covers a total of 10 different pleat depths and 2 different lengths 800mm and 1100mm. Combined with these variants, are the number of pleats that relate to the filter diameter. The machine has been designed to be fully automatic in operation, once the product to be processed has been loaded by the operator. This standalone machine uses a heavy duty electric servo driven table to index the pleat packs progressively under the welding head. The machine has a universal clamping system for the pleats, including a servo operated pre-opening jaw to accommodate all variants of pleat, and pneumatically operated final clamping for the lip of the jaws. Light guards protect the operator during the load and unload sequences. The machine has a HMI / PLC system which is used to control and configure all part related adjustments, table movements (3 or 4 welds dependant on pleat length) and weld recipe based upon the selection of a Parker Part number, and includes process monitoring. 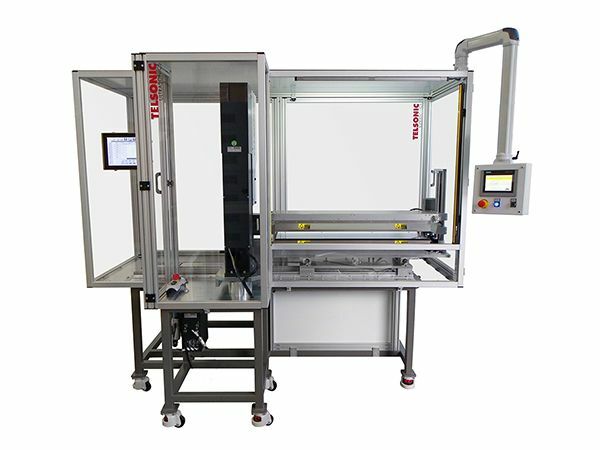 The ultrasonic welding technology within the machine is based upon Telsonic’s USP3000E Press complete with a 20kHz MAG 3.6kW generator and touchscreen interface. This interface allows recipe input, recipe storage and set up with visual displays and the capability to output all weld evaluation data. The weld recipe facilities are fully electronic including proportional pneumatic weld pressure control, weld limits and data bit selection in collaboration with the machine main PLC / HMI control system. The welding press station has an integral anvil, pleat traverse guidance tooling and part present sensors. A single 280mm long Titanium sonotrode is used for all pleat variants, with operations completed within a 26 second cycle time for a 4 weld pleat pack. A facility to rotate the welding Press within the machine provides access for easy mechanical setting and quick ultrasonic head change over or servicing. Telsonic UK were selected for this project due to the holistic approach offered by the company. This encompassed satisfying Parker’s ergonomic and system operational requirements, in addition to building a reliable production process around the ultrasonic technology. The proven reliability of the existing Telsonic machines, which have been operating over a 15 year period, and the continuity offered by Telsonic’s extensive application knowledge and service support also played a significant part in the selection process. In depth operator training courses were conducted at Telsonic’s Poole facility ahead of delivery and installation of the system. More information on TELSONIC’s USP welding presses can be found here. Telsonic UK offer a comprehensive range of ultrasonic modules and systems for a variety of plastic and metal welding, cutting, sealing, cut’n’seal, food cutting, sieving and cleaning applications within a wide range of industries.